So, let's say you want to give that Android 4.1 Jelly Bean intelligent keyboard a try, but the device you are holding on to still runs Ice Cream Sandwich. In that case, there is something at the Google Play store you might want to check out. 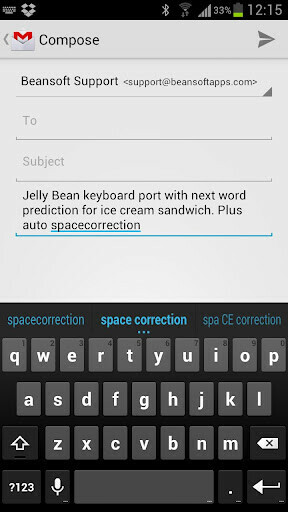 We are talking about a port of the Android 4.1 keyboard, which has been published just days ago, yet has already generated tens of thousands of downloads. 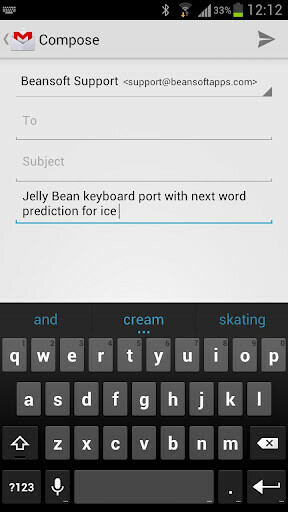 Think of it as a sneak preview, however, as this Jelly Bean keyboard is in an alpha state and there's probably still some glitches that need to be ironed out.Word prediction and auto-correction are supported only in English for now. Force closes are also being reported on some devices whenever the user attempts to add words to the dictionary. Nevertheless, this Jelly Bean keyboard port is probably good enough to be used on a daily basis, judging by its four-star rating. Interested? Then just follow the link provided below, and don't forget to tell us what you think of the app once you try it. Just remember to read the installation instructions carefully in advance. I have been using this app for the entire day and I like it a lot better then the Galaxy S3 keyboard. They predictive text is very accurate and isn't forced on you. Not too shabby really enjoy it so far. I have heard by several people that the Sense 4 keyboard is awful compared to the previous version. Using it right now and it is too small in my Razr. Keyboard is stuffed and way to tiny..... might just be a bug on my Razr. BTW, the updates said that they are going to really change it... So it might not be a jelly bean keyboard much longer. They have already changed the name. Agree with several others: I like it better than the SGS 3 keyboard..